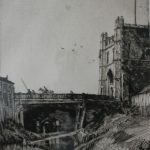 Sir Muirhead Bone was a Glasgow born draughtsman and engraver, secretary of the Society of XII, war artist 1916-18 and 1939-45, Trustee of: Tate, National Gallery and Imperial War Museum. He was knighted (1937) and became an honorary member of the Royal Institute of British Architects (1937), the Royal Society of Painters in Water-Colours (1943) and the Royal Scottish Academy (1951). He died at Grayflete, Ferry Hinksey, Oxford, on 21 October 1953. He was the father of the artists, Stephen and Gavin Bone. His work is represented in numerous public collections, including the Imperial War Museum and Tate; The Hunterian (University of Glasgow); and the Art Institute of Chicago and the Cleveland Museum of Art.